I remember the time when there were only three international chain hotels here in the metropolis—the Manila Hilton in the Manila area, the Hotel Intercontinental in Makati, and the Hyatt Regency in Pasay. My friends and I would go to the Intercon for the steak at Prince Albert Rotisserie and the unique Chicken Pork Adobo with the toasted sauce at the Jeepney Coffee Shop. The Hyatt Regency was for dancing the night away at the Circuit, or listening to music at the Calesa Bar which was the launching ground of today’s popular singers, and for the Japanese food at Tempura Misono which always came with the latest eyebrow-raising buzz around town, courtesy of its manager, the late Albert Seeland. The hotel’s beautifully designed lobby is located on the third floor. And the Manila Hilton was lording it over the local social landscape. 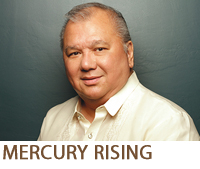 Not only was it the tallest hotel then, it was also the venue for high-profile fashion shows, at the Top of the Hilton, presented by society icon, the late Chito Madrigal Collantes. The lunchtime shows were always fully booked, as they jumpstarted the careers of most of the metro’s accomplished fashion designers, and those of the popular ramp and commercial models. It was too bad that the Hilton bowed out of the local scene in 1988, with the property being taken over by the Holiday Inn trademark. Since then, the Hilton brand of hospitality could only be availed of by us in foreign countries. Fast forward to June of 2016, the luxury label of the Hilton, the Conrad, opened in Manila, to the delight of society’s well-heeled who always go for the finer things in life. As expected, they showed full support for the new hotel, and continues to do so, as gleaned from the revenues reported by the hotel’s food and beverage outlets. Local corporate accounts and tour operators, booked their high-end customers with the hotel. The spacious and comfortable bedroom has all the modern convenience for the fastidious traveler. While we are still enjoying the Conrad’s facilities and service, here comes the good news that a brand new Hilton Manila just opened its doors to the public. Of course, we were just as excited as everybody else, so my co-Board of Trustees of Pacific Asia Travel Association decided to have our this month’s meeting at this new hotel. As part of the Resorts World Manila’s integrated entertainment complex, the Hilton Manila takes pride in its location, which is right across from our international airport. It has 357 stylishly designed rooms, exceptional amenities, completely private meeting rooms, several dining options, and an elegant ballroom. The first thing I noticed as I entered the hotel was the set-up of its lobby. It is similar to that of its sister hotel, the Conrad Manila: which has the ground floor serving only as a receiving area where the bell service is. Guests have to take the elevator to the 3rd floor to “enter” the hotel. The lobby level houses the ballroom, the meeting rooms, the buffet restaurant, and the swimming pool. The refreshing pool is every sun lover’s paradise. One nice thing I immediately noticed, as I walked towards our meeting room, is how insulated the room is from unwanted noise that may come from either the corridor or the lobby. When you open the door to the meeting room, there is still a curved walk-through space before you reach the room itself. This design assures those inside the room that no external disruption can filter through. Of course, the Hilton touch of excellence is evident in the fact that each participant is provided his/her own pitcher of iced water flavored with lemon and cucumber. Kusina, the buffet restaurant, makes any meal a celebration. The wide choice of culinary treats is any foodie’s paradise! Although I limited myself to Filipino dishes, there were many other choices representing kitchens from all over the world. An interesting feature in the restaurant is the “talipapa” where you can choose the fresh meat or seafood you want and have it cooked specially for you. Now, that’s putting Filipino cooking up on a pedestal. The bedrooms are a showcase of class and finesse, as shown in their furnishings and amenities. The layout spells convenience and comfort, as the bed is designed to guarantee a restful sleep. Getting into the spacious bedroom, I immediately liked its airy feel, that of not being confined to a small space. Of course, as expected, connectivity for any type of electronic gadget is a breeze! And what I always look for in a high-end hotel in a tropical country is its pool, and this one does not disappoint. Located on the third floor, adjacent to the ballroom, is the beautifully landscaped massive swimming facility. Its design makes one want to take of his clothes right away and laze in the sun for that attractive bronze look or jump into the refreshing, energizing blue water. The elegant ballroom can accommodate up to 360 guests. There are many other interesting things I can point out about the Hilton Manila but, due to space constraints, I’d rather you check out and enjoy them yourselves. I’m just happy that another Hilton has come to our shores, to add to the sterling list of establishments that contribute to the superior quality of life we all deserve. This time, the Hilton Manila is here to stay. Last year, I joined a very active support group for procrastinators. We haven’t met yet.